have a finely drawn, shimmering quality to them"; "plucked strings, even the uppermost reaches of vocals are sweetly detailed -- not exaggerated to any obvious degree but accentuated a small amount, which helps with the communication of spaciousness and air." "The bass likewise sounds emphasized -- not so much that it's readily apparent, but enough to impart a pleasant sense of weight and bloom." "In the mids, the Sonatina III is recessed, much of the region sounding laid-back compared to the treble or bass, and overly mellow compared to the midrange of many competing speakers." Features "The Sonatina III uses all Dynaudio drivers -- 9 1/2" woofer, 2" soft-dome midrange, and 1 1/4" soft-dome tweeter -- in a three-way design with crossover points at 2000 and 4500Hz." "The entire cabinet is made of 1 3/4"-thick MDF, which accounts for the lion's share of the speaker's heft." Use "Toe-in at the listening position was mandatory, as was listening with the grilles off. Otherwise, the Sonatina IIIs sounded too mellow, especially in the midrange." Value "The Sonatina III, with its smooth-as-glass satin finish options...and high-quality drivers, doesn't seem out of place in its price range. It's well made and looks as good as the competition." Designing loudspeakers is a discipline that requires an understanding of acoustics, the science of sound, but also involves exercising a unique, often personal vision of how reproduced music should sound. In some cases, the science informs the personal vision, and in other instances it's the other way around. Ultimately, the ratio of science to personality defines the sonic character of a particular maker's speakers and the market niche they will occupy. Alan Yun's Silverline Audio speakers are distinctive in many ways, not the least being their combination of higher-than-average claimed sensitivity and robust sound. They sound singularly like themselves -- I can't think of another brand of speakers that sounds quite the same. This is not to say that there is no engineering in Silverline speakers. Alan knows about drivers and crossovers, impedance and sensitivity, and this knowledge is at work in his products. However, to a great degree, Silverline speakers are an expression of Alan's ideas on what reproduced music should sound like, replete with characteristics that heighten the effect he's after. I reviewed the original Sonatina, a speaker model that sits in the middle of the Silverline speaker lineup, in late 1999, and I heard the second iteration, the Sonatina II, a few times thereafter at shows. Interestingly, these two speakers sounded different in a couple of specific ways. The original Sonatina sounded light and airy, and it was a soundstaging champ. The Sonatina II was a richer-sounding speaker, and its bass was more prominent as well. I couldn't help but think that the very different cabinet shapes had something to do with the different sound -- the Sonatina with its angles and facets, and the Sonatina II with its more traditionally boxy shape. I preferred the Sonatina, but former SoundStage! writer John Potis, who owned original Sonatinas and reviewed the Sonatina II, preferred the newer speaker. In terms of the shape of its cabinet, the Sonatina III looks a little like an original Sonatina that has morphed into a Sonatina II, or vice versa. The angles are back, but the cabinet is not multi-faceted and swept back like the original Sonatina's. The Sonatina III is about the same size as either of the speakers it replaces, 37"H x 12"W x 13"D, but it is heavier; Silverline says 100 pounds, but I suspect that this is the shipping weight, and 85 pounds is more accurate. This is still almost double the weight of the Sonatina. The entire cabinet is made of 1 3/4"-thick MDF, which accounts for the lion's share of the speaker's heft. The Sonatina III's greatest departure from earlier iterations is in terms of the drivers used. The original Sonatina and Sonatina II were four-driver affairs that used LPG and SEAS drivers throughout. The Sonatina was a three-way design with a pair of SEAS mid-woofers; the Sonatina II used two similar SEAS mid-/low-frequency drivers, with one crossing over to the other at 1000Hz, making it a four-way speaker. The Sonatina III uses all Dynaudio drivers -- 9 1/2" woofer, 2" soft-dome midrange, and 1 1/4" soft-dome tweeter -- in a three-way design with crossover points at 2000 and 4500Hz. So the latest Sonatina trades a pair of smaller mid-/low-frequency drivers for a single larger one. This same woofer is also used in larger and more expensive Silverline Audio speakers, including the Sonata III, which is the next speaker up in Silverline Audio's wide-ranging lineup. Claimed frequency response for the Sonatina III is 28Hz-28kHz, with a sensitivity of 92dB/W/m. On the fully finished rear of the speaker are the port and two pairs of binding posts ready for biwiring or biamping. Gold-plated all-metal jumpers are included as are sets of screw-in spikes. Alan Yun loves to discuss the Dynaudio drivers he now uses, reminding me just about every time I talk to him of the woofer's 4" voice coil. "The Danes really make great drivers. Every piece is hand built and matched to the closest tolerance. I randomly checked and found them within a range of 1-2%!" A few years ago, Dynaudio stopped supplying drivers to OEM suppliers, many of which sold to DIYers. Silverline, however, is able to get a steady supply for its speakers, which may account for some of Alan's enthusiasm. There's one more change to the Sonatina III -- the price. Our previous reviews quote the prices of the Sonatina and Sonatina II as $3800 and $4000 USD per pair respectively. The Sonatina III costs $5000 per pair, not a huge jump upward but one that puts it in the stiff company of speakers from Paradigm, Energy, Thiel and other well-known makers. Prices rise -- there's no way around it -- but the Sonatina III, with its smooth-as-glass satin finish options (maple, briarwood and rosewood veneers along with gloss piano black) and high-quality drivers, doesn't seem out of place in its price range. It's well made and looks as good as the competition. I listened to the Sonatina IIIs with my usual stable of high-quality electronics and digital sources: Lamm ML2.1 and M1.2 Reference monoblocks, a VTL TL-7.5 Reference preamp, an Esoteric X-01 CD/SACD player, an Audio Research CD3 Mk II CD player, a Zanden Audio Model 2000 Premium transport and Model 5000 Signature DAC. I also used the Sonatina IIIs with other products I was reviewing: Blue Circle's BC204 stereo amp and Einstein's The Tube preamp. Speakers for comparison were Thiel CS2.4s, which I reviewed late in 2003 but kept in order to use with Thiel's SS2 subwoofer. Luckily, the CS2.4s and Sonatina IIIs crossed paths here for a couple of weeks. As I discovered through much experimentation, the choice of cables was important with the Sonatina IIIs. They sound their best with fast, open, detailed interconnects and speaker cables -- like Nordost Valkyrja and Valhalla, which I used for the bulk of my listening. Power cords were from Shunyata Research (Anaconda Alpha and Vx, older Python and Taipan) as was power conditioning (via a Hydra Model-8 with Anaconda Alpha power cord). Electronics sat on a pair of Michael Green Designs racks, except for the Lamm ML2.1 amps, which have their own Silent Running isoBase 3.0 platforms. I positioned the speakers well out into my large 20' x 29' listening room, leaving in excess of five feet behind and to the side of each speaker. This was the spot in which the bass sounded its most nimble. Toe-in at the listening position was mandatory, as was listening with the grilles off. Otherwise, the Sonatina IIIs sounded too mellow, especially in the midrange. All of the amps I had here for use with the Sonatina IIIs drove the speakers to reasonable levels, but I preferred the hybrid Lamm M1.2 Reference monoblocks over the SET ML2.1s or the Blue Circle BC204 stereo amp. The Sonatina IIIs thrived on the power and drive of the Lamm amps. I suspect that a clear, open-sounding solid-state amp like the discontinued Audio Research 100.2 would be a great match for the Sonatina IIIs, although I know that Alan Yun prefers tubes with his speakers. The original Sonatina was the recipient of the first SoundStage! Network Best Product Debut award and a speaker that, over six years after I reviewed it, I remember well, partially because I don't think the Sonatina II was quite as good. When I saw the Sonatina III at CES earlier this year, I immediately wanted to hear a pair in my system, just to determine how the speaker had changed and hopefully to hear that the sound of the original Sonatina had been revived. Yes, the Sonatina III reminds me of the original -- its sweet, airy and spacious presentation. It is also reminiscent of the Sonatina II, whose bass weight and warmth are present and accounted for. I can't say with surety that the Sonatina III is better than the two iterations that precede it -- it's been too long since I've heard either speaker -- but I can say that its sound is identifiably from the Silverline family and uniquely enjoyable in a few specific ways. First, the treble. The highs of each Silverline speaker I've heard have a finely drawn, shimmering quality, and the Sonatina III's are no exception. Cymbals, plucked strings, even the uppermost reaches of vocals are sweetly detailed -- not exaggerated to any obvious degree but accentuated a small amount, which helps with the communication of spaciousness and air. Even so, the Sonatina III's highs never turn hard or steely, perhaps due to the soft-dome tweeter, perhaps due to Alan Yun's voicing of the speaker. The bass likewise sounds emphasized -- not so much that it's readily apparent, but enough to impart a pleasant sense of weight and bloom. I've been listening to a lot of jazz piano recently -- solo, and in trio with bass and drums. Two of my favorite contemporary pianists are of Latin heritage and infuse their music with Latin rhythms: Michel Camilo and Danilo Perez. Camilo's Solo [Telarc SACD-63613] is a very different-sounding recording from Perez's Till Then [Verve B0000286-02] -- more full in the lower midrange and bass (as many Telarc recordings are), on the dark end of the spectrum overall. The Sonatina IIIs conveyed the harmonic complexity of the piano on both recordings as well as the differences in playback format -- Solo is an SACD. Mostly, however, the Sonatina IIIs portrayed the pianos' physical presence, this due to the speakers' hefty portrayal of the lower registers and ability to capture overtones as they spread throughout the recording venue. This didn't make for an utterly transparent presentation, but it certainly made for exciting listening, the pianos as subjects of the aural equivalent of bas relief. The effect of the Sonatina III's bass and treble is rather like that of a loudness-compensation control, and it makes listening to music at lower levels satisfying. Wilson Audio speakers accomplish this same thing, though through different means: removal of residual distortion that muddies the signal. Either way, it's nice to listen at low levels, especially when the music is tranquil, like Guy Van Duser and Billy Novick's Lovely Sunday Afternoon [Daring Records 25101-3035-2], which features acoustic guitar, clarinet and a few vocals -- nothing more. The Sonatina IIIs imbued this quaint music with a honey-like glow, especially Novick's clarinet, which sounded ripe and juicy. The Sonatina IIIs had a near-magical way with this music, their treble and bass imparting poise and elegance in abundance. In the mids, the Sonatina III is recessed, much of the region sounding laid-back compared to the treble or bass, and overly mellow compared to the midrange of many competing speakers. Here is where Alan Yun's fingerprint is most obvious, perhaps to compensate for the sound of peaky digital playback, perhaps to re-create the character of certain tubed amplifiers of which he is fond. Just about any vocals will show this tendency; I used James Taylor's New Moon Shine [Columbia CK 46038] and the cut "The Frozen Man," which didn't have the same energy and zing because Taylor's voice was more distant than with other speakers. But here's the thing: Even with the Sonatina IIIs' quirks and foibles, I can't say that I did anything but enjoy listening to music with them. I knew what they were doing -- I could hear it -- but the speakers' overall voicing is so consonant with the essence of music that worrying about the sound was a distant second to enjoying what I was hearing. This is not the case with most speakers that stray from neutrality in an obvious fashion. Often the sins pile up and never let you forget their presence. But the Sonatina IIIs have a way of reaching listeners -- sounding mellow through the mids, gorgeous through the highs, and bloomy through the bass -- such that their overall character is satisfying, not frustrating. So while Alan Yun hasn't created the most neutral speaker on the planet, he has created one that flatters recorded music. Like the original Silverline Sonatina, Thiel Audio's CS2.4 won a SoundStage! Network year-end award, in the CS2.4's case for Aesthetics & Sound. 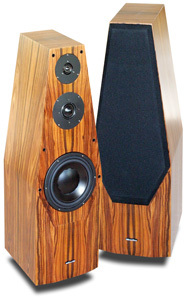 The CS2.4 ($4400 per pair) is an achievement in loudspeaker design and manufacture. It features Thiel-designed and -made drivers, including a coincident driver array that places the tweeter dome at the center of the midrange driver, with the two sharing the same voice coil. I called the CS2.4 "a precise, high-fidelity design." "If you want warmth or sweetness or some other coloration from your speakers, the CS2.4s will disappoint you -- they're far too neutral." The CS2.4's bass goes very deep, but doesn't have any additive weight or warmth. In short, the CS2.4s give you your music in an unadulterated form -- straight up, no ice. As you might be able to guess, the Sonatina IIIs are rather different -- more contoured in their sound. The music they present is sweeter and warmer, while the Thiel speakers present it as it is, without coloration. Through the mids this is especially noticeable, the Thiel speakers sounding incisive, even merciless in their quest to reveal as much musical information as possible, and the Sonatina IIIs sounding more laid-back and gentle, even somewhat muted by comparison. The midrange of both speakers means you'll want to be careful in terms of ancillaries, although the Lamm M1.2 Reference amps sounded splendid with both speakers. I didn't have the Thiel speakers at the same time as the Blue Circle BC204 amp, but I suspect that the two would have made beautiful music together. The CS2.4s definitely go lower than the Sonatina IIIs, but you'll have to do some close listening to discern this, as the Sonatina III's bass has greater weight and bloom, imparting the illusion of bass depth. "Joe Slam and the Spaceship," from Harry Connick's She [Columbia CK 64376], a track I've used for years to gauge bass depth, shows the differences easily, with the Thiel speakers rumbling at a point where the Silverline speakers do not. "Joe Slam and the Spaceship" is an extreme case, however. With most music, the low frequencies of these two speakers, while different, will suit most listeners. In many ways, the main difference between the Thiel CS2.4 and Silverline Sonatina III boils down to a matter of the heart (with the Sonatina IIIs) versus a matter of the head (with the CS2.4s). Knowing Alan Yun and Jim Thiel as I do, I suspect that neither would object to their speakers being characterized this way -- or want to change the perception. Categorizing something as broad and complicated as human personality is a coveted goal among social scientists. Imagine what such a system could tell us about ourselves (and tell companies about what we will buy). Categorizing the sound of loudspeakers is sometimes just as challenging, due to the many permutations and combinations that designers' personalities and the principles of acoustics can take. Over the years I've heard a number of Silverline Audio speakers and liked them all in various ways. The Sonatina III is a worthy successor to the original Sonatina and a speaker that will appeal to the personalities of some audiophiles immensely. Its treble and bass regions give the music a pleasing sense of air and weight, and while the midrange is certainly mellow compared to that of the competition, the overall mien of the speaker makes listening to music fun. The Sonatina III is no "me too" speaker. Instead, Alan Yun has chosen to design a speaker that he enjoys, and hopes you will too, rather than one that follows any rules of acoustics. If the science of speaker building bores you as much as listening to music excites you, the Silverline Sonatina III should be at the top of your audition list. Alan Yun has done it his way, and how. Warranty: One year parts, five years labor. Thank you very much for your effort and time spent in making the review of Sonatina III so informative, detailed and, after all, very precise. In your review, I have to admit you observed some of the key points of the design of Sonatina III. One of these aims to compensate for the sound of peaky digital playback. It is always my wish to design a speaker that everybody enjoys and finds listening to rewarding. It'll never change.